Joel Ward of the San Jose Sharks jets toward Nashville Predators goalie Pekka Rinne after two passes from teammates. The sound of his skates click on the ice, as he’s able to flip the puck over a defender’s stick. There’s nothing left but open space between him and the goalie. He shifts the puck back and forth before pushing it wide left to extend Rinne. The move is imperfect — as it forces Ward to do a small spin at the end — but he nails it as Rinne’s overextension allows Ward to pull the puck back to the right and sneak it in between his leg to score. Of the many times Ward has come up big in the Stanley Cup playoffs, and specifically in Game 7s, this particular goal — the second of five the Sharks scored in a 5-0 Game 7 blowout of Nashville in this year’s NHL Western Conference semifinals — is a microcosm of Ward’s journey as a black man in the NHL. But Ward isn’t the only black player fighting for the right to hoist Lord Stanley’s Cup at playoffs end. Ryan Reaves, the local tough guy for the St. Louis Blues, Penguins defenseman Trevor Daley and the Tampa Bay Lightning’s J.T. Brown are all hoping for the same outcome. 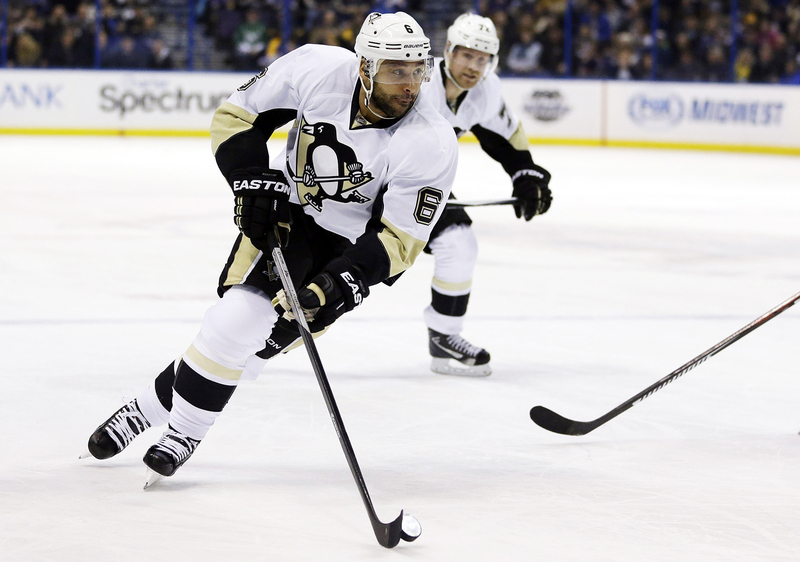 AP Photo/Jeff Roberson Pittsburgh Penguins’ Trevor Daley brings the puck down the ice during the first period of an NHL hockey game against the St. Louis Blues Monday, Jan. 18, 2016, in St. Louis. To understand Ward — who’s had a goal in every Game 7 victory he’s played in since 2011, scored with 1.3 seconds remaining in the second round of the 2015 playoffs and endured the racist comments hurled his way when he scored the game-winner against the Boston Bruins in 2012 — one has to understand the road he took to become a pro. Ward’s commitment was inspired by his father, Randall, who suffered a stroke from a blood clot that traveled to his brain while watching his son play. Ward, who was born in Canada, wasn’t selected in the NHL draft, and he didn’t get a ton of looks coming out of high school, either. He was taken in the 15th round by the Owen Sound Platers of the Ontario Hockey League, a major junior league where teenagers with NHL aspirations play to improve their game and draw the attention of NHL scouts. The San Jose Sharks’ right wing didn’t start his NHL career until he was 26 years old, after trying and failing repeatedly to latch onto a team. 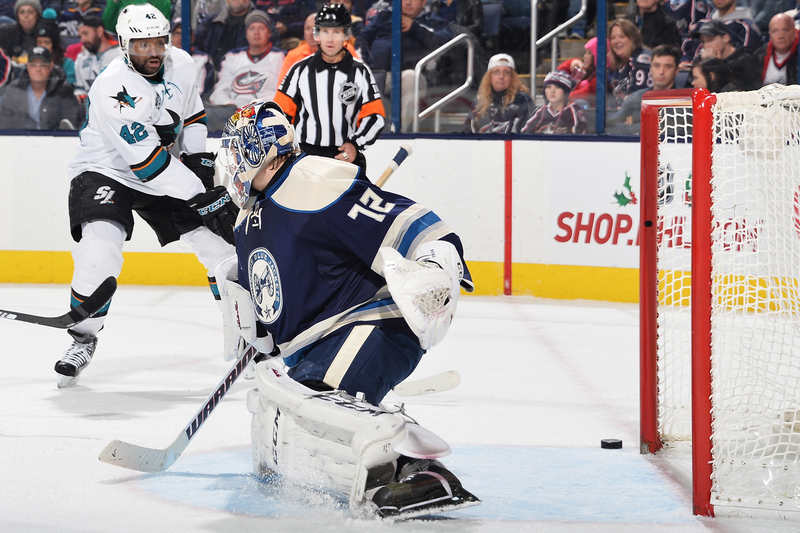 Photo by Jamie Sabau/NHLI via Getty Images Goaltender Sergei Bobrovsky #72 of the Columbus Blue Jackets defends the net as Joel Ward #42 of the San Jose Sharks skates after a loose puck during the second period on November 22, 2015 at Nationwide Arena in Columbus, Ohio. Before Ward was brought onto the Predators, he tried out for and was cut from four teams — the Atlanta Thrashers, Detroit Red Wings, Minnesota Wild and Florida Panthers. He was only offered one American Hockey League (AHL)/East Coast Hockey League (ECHL) contract. “I just needed to get to the American League somehow,” said Ward, 35, to ESPN’s Julie Robenhymer in Dec. 2015. “That was my goal. I just needed to get there, and if I did that, then I could give myself a shot of making it to the NHL. I just had to keep working hard. Just before he played with the Panthers’ minor-league team, the Houston Aeros — the Wild’s AHL affiliate — offered him a one-year deal. Ward then signed an NHL/AHL contract with Houston and Minnesota for two years, but after playing 11 games for Minnesota, he was back on the market when the two years were up. For a moment, it appeared Ward would have to play for Nashville’s AHL affiliate in Milwaukee. But once he made the team, Ward thrived in Nashville, scoring 17 goals and recording 18 assists in 79 games in his rookie season. He also gained a reputation as a beast in the playoffs. In the 2010-11 playoffs, he scored seven goals and had six assists in 12 games for the Predators. After three seasons in Nashville, Ward moved onto Washington , where he reunited with former Predators coach Barry Trotz. Ward spent four seasons in Washington, D.C., before signing a three-year, $9.8 million contract with San Jose this offseason. It was in the nation’s capital that he switched his jersey to No. 42, a nod to baseball legend Jackie Robinson, whose memory he later evoked in his first public response to the racial slurs Bruins fans called him. Less than 70 penalty minutes may not seem like much of an accomplishment, but to put it in perspective: In 64 games with the Blues this season, Reaves had 68 penalty minutes. In 2011, he played 60 games and had 124, and two years later, he sat in the penalty box for 126 minutes in only 63 contests. Not to mention that he had 78 penalty minutes in 28 games during his rookie campaign, and in 43 contests in 2012 had 79. The less time Reaves is in the box, the more time he has to make opponents weary of his ever-looming presence and penchant for body-crushing hits. The 29-year-old also has a knack for blowing up social media, especially when he plays against the Dallas Stars. He brought the dab to the NHL after scoring his first goal of the 2015-2016 season, and then proceeded to teach his teammate the dynamics of the move on the bench. Following a fight when the St. Louis and Dallas met in the semifinals, the forward blew a kiss to the team’s bench. Reaves on Benn saying he'll remember the kiss: "Did he catch it and put it in his pocket? … I don't know why that's a big deal to him." So besides knowing when to knock heads off, the sixth-year NHL player has also mastered the art of getting into his opponents’ heads — which is just as important in throwing off someone’s game. Daley played with the Dallas Stars for 12 seasons. In 2011, he recorded his 500th game with the team that drafted him in the second round in 2003. But in July 2015, the Stars traded him to the Blackhawks for Patrick Sharp and Stephen Johns. He played all of 29 games, recording six assists, before Blackhawks general manager Stan Bowman traded Daley to the Pittsburgh Penguins in Dec. 2015, allowing him a fresh start. Daley broke his ankle in Game 4 of the Eastern Conference final, but before that he played 53 games, netting six goals and tallying 16 assists. And as the playoffs have waged on, he contributed one goal and three assists for the Penguins. Don’t let that one goal fool you — that score was huge in the Penguins’ Game 4 Eastern Conference semifinals matchup with the Washington Capitals. Daley stepped in for Pittsburgh’s top defenseman, Kris Letang, as he served a one-game suspension. The 32-year-old set the tone early in his 28-minute performance. After a pair of passes, Daley received the puck at the top of the right circle and sent a heat-seeking missile that crept through three sets of legs to reach the net. Tampa Bay Lightning right wing J.T. 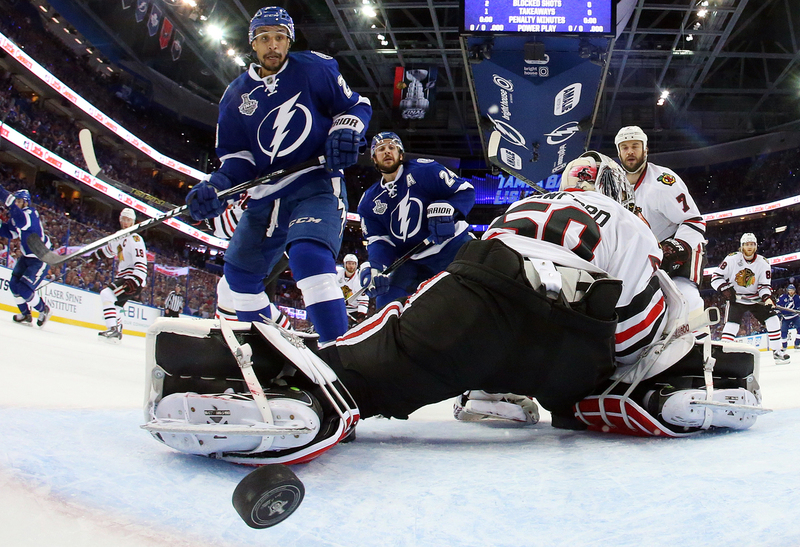 Brown, left, watches as Cedric Paquette’s shot goes by Chicago Blackhawks goalie Corey Crawford during the first period in Game 2 of the NHL hockey Stanley Cup Final in Tampa, Fla., Saturday, June 6, 2015. That put the Penguins up 1-0 in a game that would require two overtimes, but would ultimately fall in favor of the home team, 3-2, and put Pittsburgh up 3-1 in the series. “It wasn’t going to be just one guy stepping up — it was a collective effort,” Daley said. “I know well enough when you do get an opportunity, you have to take advantage of it. There’s no bitterness when Daley speaks of his longtime team or the Blackhawks — he learned a great deal from both. Each set of circumstances allowed him to come in and play seamlessly in that particular game and overall since he arrived. He said having children helped put things in perspective and helped him realize life was not just about him and his career. There was no pressure on Brown during his rookie season in 2011 — Tampa Bay’s coaches just wanted an idea of what he could do. Ultimately, the team moved him down to Syracuse, New York, for a year to develop. Besides learning the different rigors of the AHL game versus the NHL game, Brown also took time to mature as a person. If college is a place to make mistakes, then Syracuse was the place where Brown would come into his own. He went to the University of Minnesota-Duluth, which was only a two-hour drive from his family’s home in Rosemount, Minnesota, so up until he was drafted by the Lightning, he had never truly lived on his own. In Syracuse, he figured out how to truly be a professional athlete. He also got an opportunity to play with people who would move up with him to the NHL, so that when Tampa Bay captain Steven Stamkos was injured on Nov. 12, 2012, the transition wasn’t jarring. As the Lightning try to avenge last season’s shortfall in the Stanley Cup, Brown has returned after suffering an upper-body injury on April 15. In Brown, Tampa Bay has a guy who does the utility work and thrives in doing so. It was during that year away from the NHL that Brown truly committed to the idea that there were a multitude of ways he could help his team win. And in doing those things, he’s become a substantial piece of the Lightning’s championship puzzle. Correction: In this story on the undefeated path of four black hockey players, on one occasion Joel Ward was described as an African-American, but he was born in Ontario, Canada. Also: The name of the Owen Sound Platers was corrected. This has been updated.